It’s no secret that I’m pursuing my passion. I talk and think about it multiple times every day. One thing that’s a negative about me pursuing my passion is that I have to leave my job. Yes, it will be great to be able to do things that I enjoy in life, and to have more time to do what I want, but this means that I have to actually quit my job. I am currently a financial analyst/investment banker and have been doing this for over three years now. Definitely no passion in this job, at least not for me. Some people think that I’m just being a baby, but my work really does rely on me a lot. I know a lot of people probably say this and believe that they are irreplaceable, but I can truly say that my work is very reliant on me as I was/am in the process of being Vice President and then President in a couple of years. It also takes 3 to 5 years to train someone for my position (you need at least 2,000 hours after you earn your designation, which takes 2-3 years, in order to be certified), and there is a very limited amount of people (this includes me and my bosses) in the world who do what I do for a living, so the possibility of them replacing me with someone who doesn’t need to be trained at all and who already has the certification is very small. There are more details to this, but it will just make me sound like a terrible person for wanting to leave. All of my friends and W all think that when I tell them that it will go horribly, and they all know how important I am in my firm. I’m absolutely terrified of telling them, and I would of course like to leave on good terms. The people I work with are wonderful people, and have always been very nice to me. And that’s why it makes it even harder to leave, because they are great! I don’t want to burn any bridges. Even though the city I live in is fairly large with millions of people, everyone seems to know everyone in some way. I might need to use them as a reference in the future as well, and I would hate to hurt that in any way. Of course, I don’t want to think of something bad happening with my freelancing, but you never know! I can’t think of many instances where it would be better to tell everyone else before your boss first, so definitely tell your boss first. Of course I have told all of you through my blog, but I do blog somewhat anonymously. Tell your boss before you tell your coworkers. Try to keep everything positive if you can. Different circumstances will lead to either positive or negative outcomes, but if you can be positive and you leaving is actually in your control (such as if you found a better job or are pursuing your passion instead) then keeping everything positive is most likely best. Be thankful and appreciative for your time in your position and let your boss know of this. You should definitely give your work notice. Unless there are certain circumstances where you cannot, you should give at least 2 weeks notice so that your employer can prepare and hire a replacement. You should be prepared for them to ask you to leave immediately, and you should also be prepared to stay an extra 2 weeks or so. Do what is right for you though. For me, 2 weeks won’t help them much, but I will be giving notice. They might have me just leave right as I am telling them. However, if they do ask that I stay an extra month, that will not destroy my life so I will do that as well. Like I said, I do like my employer, and I don’t just want to leave them hanging. Luckily, I have been in the process for quite some time with creating an instruction manual for smaller parts of my position. This will make it a little bit easier for someone who replaces me, as this instruction manual is over 100 pages of very detailed information. 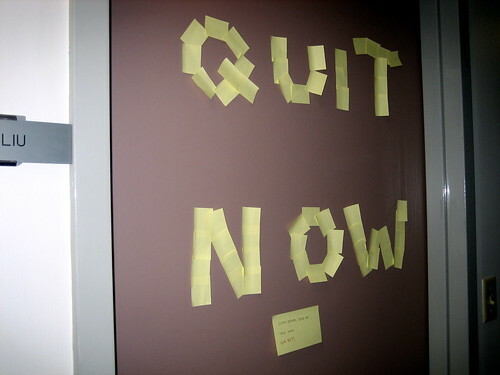 What tips do you have for someone who wants to quit their job? Have you ever been scared to quit your job? If you are interested in leaving your job, then I highly recommend the book How To Engineer Your Layoff. The author of the book negotiated six years of current living expenses and gives tips on the best way to leave your job. Click here to get the book today. I agree that you need to be prepared either way. Sometimes they say leave and other they will ask you to stay a little while longer. I guess it all depends on the relationships you have at work. For me I was able to go to my director and let him know I was thinking about going to another company and I asked how should I handle it. He told me that it would really help if I could stay to train a new person. That really wasn’t an option as the new company had a start date. We worked it out and I stayed for a month and helped them find a person but was gone before they started. You maybe able to talk to someone like your boss and give them the heads up and see what they say. They may want you to be there for another 6 months but MAKE SURE you are leaving before you say something. I have known people to talk about living, tell there bosses but then decide that they want to stay. That puts you in a bad position. Thanks Thomas! It’s definitely hard and I need to make sure I am 100% prepared. @Thomas- Great advice! I agree that its best to keep your boss informed. It also lessens the office drama if you’re upfront and honest. I was so burnt out when I finally left my job but I did manage to give three weeks notice. I’m glad I did because I was able to leave on good terms and not burn any bridges. Looking forward to joining you all in the self employed arena someday soon. This is something that has been on my mind a lot lately for many reasons. The business I work in is a family owned business, and everyone here is really tight knit. It’s expected that I will work here for a long time, so if I ever do want to leave (which I think is just a matter of time – this isn’t my forever job) it’s going to be REALLY hard to do so without upsetting people. Thanks for the tips though, I never though about them asking me to leave immediately, I’ll have to make sure that I have a big e-fund in case that happens. This is exactly how I feel! My company is VERY, very small. I think as long as you give them enough notice they won’t be mad at you. You ultimately have to do whats best for you and I think everyone should be able to understand that. I was terrified about leaving my last job and looking back I have no idea why as they did end up replacing me with someone else fairly quickly. The only reason I ended up leaving was because I was expecting a baby so it was sort of ok and I felt like there was enough time to prepare on both sides. Now I just think it was a job that I didn’t like that much and I should have left sooner! I was on a three month notice period – three months! At the end of the day, we have a right to want to explore other avenues and employers should accept that. I’m sure you will leave on good terms particularly if you are offering to stay on for a while if need be. Leaving my current job will be trickier than my last as the company is TINY in comparison. Hiring someone to cover me for six months was difficult (and she is apparently quitting as it’s too much for her) and so not sure what will happen for the rest of the time I am away. Even finding someone to cover for me for a two week holiday last year was a headache. We have to look externally as there is zero fat; everyone is already way overloaded. Wow crazy! My company is super small also. I am actually in the process of writing a similar post for my own blog. When I quit my first job, I had so much anxiety about it. I had felt a huge sense of loyalty to the company and I felt bad for leaving because they had invested so much in me. Looking back on it, I had no reason to worry. At the end of the day, you have to remember that it’s business. You can’t let that hold you back from pursing your dreams and there’s no point in staying somewhere where you’re not happy for no reason. Your bosses will understand, they’re people too. If you can, try to give them more than 2 weeks notice to make the transition a little easier (of course you are not obligated to do this). You are right! Thank you so much. I have walked out on employers there were fantastic to me and treated me very well in pursuits of my passion(s). I left a great job in Ohio to move to Florida for a while because that’s what we wanted to do. It was hard giving them notice because they were a small business that emphasized employee morale first then business. Another employer of mine loved that I had the skill set to cook for more than 200 people without breaking a sweat but my heart wasn’t in it. Great guy to work for and the second hardest “I’m moving on” notice. The only tips I can offer is if you never take the leap you’ll never know what you can or can’t achieve. Like I said we quit our jobs, sold all our belongings and moved to Florida with no safety net. It took us about 4 months to get back on our feet and we enjoyed that lifestyle for 4 years. We took a leap of faith in ourselves and came out on top. Keep your bridges in tact and ask for referrals while you are still there that way you can put them in a portfolio should you ever need them. I think you will have no problem coming out on top though as you seem to have everything well rounded out. I already make a decent amount here, so a raise wouldn’t change anything for me. And I would be fine with training a replacement. My tip would be make sure you already have somewhere else to go. Don’t quit your job too early, before you have something else already lined up. It may mean working a couple years longer at a job you don’t care about while you pursue your dream at the same time. To many people say “I’m pursuing my dream,” and quit their job with the false belief their dream will instantly come true. Then when they get disillusioned with their dream or it doesn’t pan out for some reason they have nothing to fall back on. Not a good place to be. These are great tips. I totally agree that it seems like everyone knows someone and burning bridges is a bad move no matter what. My wife and I want to move soon and I am dreading how I will break it to my current employer. I like all of them too much to want to hurt them. I’m glad someone else is in my shoes! Why do you guys want to move? I definitely agree that you should never burn bridges. You never know what the future holds and it is always better leave on good terms. In March, I left my manufacturing finance job of nearly 5 years to take an upper level government finance job. I left a job where I knew the company and my job inside and out. I was comfortable. Going to the new position, I knew nothing! I’m slowly learning but my predecessor left without proper notice so I had zero training. Anyway, long story short, I was terrified to leave my last job! I actually just quit my job to take a month of and get my mind together. I have about 3 months worth of saving so I’m not stressing right now. My job was dead end. No raises or promotions. I figured I will have a better chance meeting people and finding something better instead of staying somewhere where I disliked and just waiting. If you are not in a rush you can always offer to help train your replacement. My wife did that and left on really good terms. I will definitely be doing that. Everything you mentioned in your post seems like the right steps on how to leave a job on good terms. Also, with your reason for leaving to pursue your passion seems like it would be accepted more than say if you left for another employer (at least in my eyes, this is how I would view it). I can’t really suggest anything else, except just be honest when you are ready to make the move. I too work in the financial services industry and you’re so accomplished for being at such a young age. It’s amazing! Your employer will definitely appreciate the time you put into making that instruction manual. It doesn’t sound like you will be burning any bridges. That’s a good suggestion from Nick. I wish you the best of luck, Michelle. I know they will be upset as you said, but no one can blame you or be mad at you for doing what you love. They might be upset at first, but it truly can’t last forever. I don’t know if there’s any way you can stay on on a consulting basis to answer questions etc. but anything to soften the blow? I may have to do that. Thanks Cat! I’ve never been afraid to leave my job. My advice would be to be observant. Other people in similar positions have likely left before you, so use their examples as what to do and what not do do. No one has actually left my employer while I’ve been here, and no one will. So I have no one to watch! Great tips! I’ve been on both ends of quitting jobs (I’ve quit jobs and had people resign) and it’s actually an emotional process. I’ve had a few people cry when they quit… it’s a difficult decision and sometimes has nothing to do with the job itself. I’m in HR and I’m always impressed when an employee offers to train their replacement. Because the recruitment process takes a while, very few are still around to train their replacement. But I always remember those who offer and if I’m ever asked for a reference, I mention that instance to show their dedication to their job and the company. It’s a very nice touch. Very good to know. Thank you so much! Great tips here, Michelle. I used to be afraid to quit jobs, but then my dad told me that they wouldn’t think twice if they had to lay me off – we all have to do what’s best for ourselves, Michelle. You’re so right about never burning bridges too – you never know what opportunities might arise in the future where a former co-worker/boss might be involved. Good luck to you! It’s not easy to leave a job and I think the most imporant thing is to not burn bridges since it’s very likely that you’ll run into them again in the future. I always do! Maintaining your reputation is key. Best of Luck! You’re already thinking about how to keep your network going. You’re right- it’s so important to not burn any bridges when you leave a job. To leave a job, first go find another one. It’s wise to do so. You never know what future holds.